DVC refers to the Disney Vacation club which is the Disney version of "vacation ownership." For those who are unfamiliar with how DVC works, members purchase a real estate interest and are then given an annual allotment of vacation points. These points are used to book vacations at Disney Vacation Club Resorts as well as hundreds of other destinations around the world. The larger the real estate interest, the more days or larger the accommodations members can enjoy. The DVC Planner App is a great tool for figuring out exactly how many points are required for any given resort, accomodation size and date. It is currently available for the iPhone, iPod touch, and iPad. After decades of visting Walt Disney World, my wife and I finally made the decision to purchase a DVC membership in October of 2009. It is something that we should have done years ago. 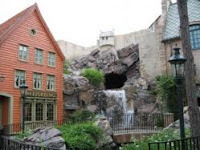 It allows us to stay in deluxe Disney resorts for a fraction of the normal cost. We purchased our membership at Bay Lake Tower at Disney's Contemporary Resort which is a short walk from the Magic Kingdom. Without getting into specific costs, our membership is for a duration of 50 years and it pays for itself in about 7. Needless to say, if you vacation at a Disney resort at least once every two years, the Disney Vacation Club is definitely the most cost effective way to go. In addition to top notch accommodations, a DVC membership gets you fantastic discounts on everything from dining to annual park passes. A DVC membership is a great option for serious fans of Walt Disney World, but the point system used for booking trips can sometimes be complicated and confusing. This is especially true for new members. 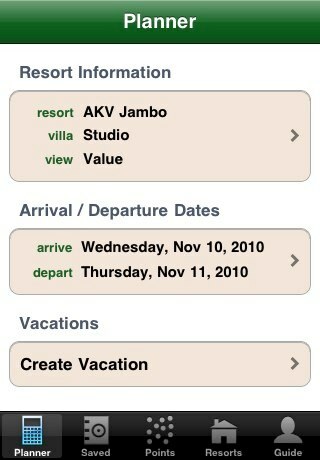 The DVC Planner App is a good way to quickly figure out how many points are necessary to book your vacation. You simply choose your desired resort, type of accommodation, and travel dates and the app instantly calculates how many points you need for the trip. It also breaks down how many points are needed for each day of the trip, as some days require more points than others. In addition to a good point calculator, the DVC Planner App has some additional features. First, you can save and email vacation plans right from the app. This comes in handy to let the other members of your party follow along in your planning. You can also export your travel dates right into your device's calendar. Along with the planning features of the app, there are good descriptions of the DVC resorts that include pictures, addresses, and resort telephone numbers. Finally, there is a section to input information about your membership including your member number and the DVC reservations phone number. If you are a DVC member and own an Apple handheld device, I highly recommend the DVC Planner App. It is currently available in the iTunes store and costs $1.99. If you aren't a member but would like to learn more about the Disney Vacation Club, send me an email and I'll point you in the right direction. It really is the best way to vacation at Walt Disney World as well as other Disney destinations. Now that we have entered the 2nd decade of this century, most of us over the age of 10 have a cell phone. If your cell phone was manufactured anytime in the last few years, there is a pretty good chance that it contains a camera. These cameras can be very simple, low quality afterthoughts or they can have the ability to take spectacular photos and even high-definition video. No matter how basic the phone, just about all of them allow us to snap a picture and quickly send it to friends and family via a text message. 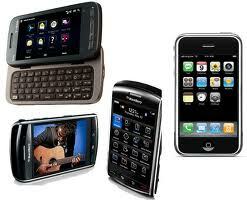 This type of text message is specifically referred to as an MMS (Multimedia Messaging Service) message. Walt Disney World is the most photographed destination on the planet. In 2011, it would stand to reason that more picture messages are texted from here than from anywhere else. This has to be one of the best uses of modern technology available today. I have snapped pictures of my son Christopher standing with a prominent Disney character and they have shown up on his grandfather's Blackberry in less than 10 seconds! The fact that grandpa is over 1,000 miles away is of no consequence. The kids of this generation take this technology for granted, but it wasn't always this easy. I have sworn that I would never use the term "back in my day," but it is becoming impossible to avoid as I approach 40 years old. Soooooooooo, back in my day the process for delivering a cute picture of ME to my grandfather was as follows. First, one of my parents would have to get in the family automobile (usually a very large sedan with bench seats in the front and back) and drive to the local department store. They would need to go to the store to purchase something called "film." If the film was bought too far in advance of our vacation, my dad would put it in the refrigerator to preserve it. At the appropriate time, the film was loaded into the camera and we would be ready to take pictures on our vacation. Actually, we'd be ready to take pictures in the airport, on the plane, and maybe checking into our hotel. A roll of film only held between 12 and 36 pictures, so we were on a second roll well before we ever made it into the Magic Kingdom (the only park at WDW until 1982!). By the time our vacation was over, we would usually have 8 to 10 rolls of film to bring back with us from Florida. 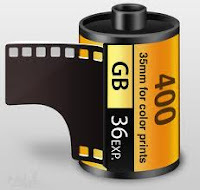 Notice how I said rolls of film and NOT pictures. We were still several steps away from actually viewing anything at this point and my grandfather wouldn't see them for weeks. Usually a few days after recuperating from our trip, one of my parents would hop into the family car and head back to the department store, or maybe even a "Photomat," with the undeveloped rolls of film. A few days to a week later, we would finally have our pictures. Many of these photos would be out of focus or too dark, but we finally had them in our hands. Then, probably close to a month after the original pictures were taken, my grandfather would actually get to see a picture with me and Mickey Mouse. Today, the entire process from taking the photo, to texting it as an MMS, to my dad opening it on his Blackberry, takes under one minute! We've come a long way in a generation! Now, lets fast forward to this week. As I have mentioned many times since starting this blog, the Disney online community is very large but is made up of friendly, like minded people. One of my online friends is Len Testa, who is certainly a leader in the Disney fan community. In addition to being an author of the Unofficial Guide to Walt Disney World and part of the TouringPlans.com team, he is also one of the core four from the WDW Today podcast, which I featured a few articles back. Len was nice enough to send me an MMS text message from the midnight Star Tours II event at Disney's Hollywood Studios, last Thursday. It is a picture of Len and his daughter Hannah and it's a great example of how friends can instantly share a little bit of Disney World using their cell phones. Thanks again Len! Lou Mongello has done it again! Anyone who has been following this blog has heard me mention Lou in several different articles. He has really become a leader in the "unofficial" Walt Disney World fan community. Lou is the creator and host of WDW Radio, which I wrote about in my very first article. He is also the author of The Walt Disney World Trivia Books and the publisher of Celebrations Magazine. Lou is the writer and narrator of the Audio Guides to Walt Disney World and he has recently started giving private, historical tours of the Magic Kingdom. On Wednesday nights, he hosts the WDW Newscast, which is broadcast live and allows for interactive chatting via the internet. In his spare time, Lou does public speaking and hosts fan meet ups in the Vacation Kingdom. Amazingly enough, the subject of this article is about yet another new product that this talented individual has created. 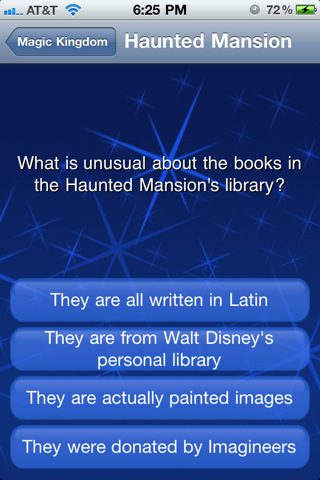 It is called the WDW Trivia App and it is currently available for the iPhone, iPad, and iPod Touch. In writing a blog about modern technology and Walt Disney World, I love when I have the opportunity to introduce and review new products. The WDW Trivia App falls into this category. There really is no better authority on the subject than Lou Mongello, who is widely known as the Disney World "trivia guy." He has built a simple yet comprehensive app that contains over 750 multiple choice trivia questions on nearly 90 attractions. The questions are well organized. First, you select the park you are interested in. You will then find individual attractions listed under the land or area of the park where they reside. You simply touch the attraction and the game begins. Each attraction has a different number of questions, and each game ends after all the questions are answered for that attraction. You receive a score based on the percentage of questions that you answered correctly. This app has several features that make it unique and alot of fun. First, after you select an answer to each question you are immediately notified if you are right or wrong. My favorite aspect of the app is that the user is rewarded with a detailed explanation of the correct answer no matter if it's answered correctly or not. We learn something interesting about Walt Disney World after each and every question. At the same time, it challenges us Disney World enthusiasts and can be very humbling at times. After finishing each "game" you are invited to post your score online via Twitter. 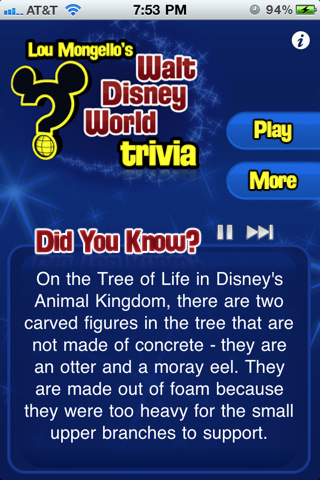 There are two other aspects of the WDW Trivia App that I want to mention. There is a section entitled "Did You Know" on the home screen that scrolls through interesting facts about Walt Disney. Each bit of trivia is posted for about 10 seconds. However, the user has the ability to pause the scrolling if they want to. Finally, there is a tab labeled "More" that can be accessed from the home screen. A simple tap will bring you to a list of a dozen links related to Lou Mongello. 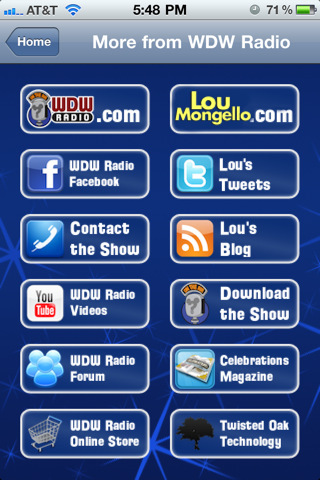 You can quickly access WDWRadio.com as well as the show's Facebook page and Lou's Tweets. The WDW Trivia App is a must have for any Disney World fans with an applicable Apple device. Not only is it a great way to pass the time, but you will surely learn something new each time to use the app. It is certainly worth the $3.99 price tag and it has quickly become one of my Disney favorites. Just as with everything Lou Mongello does, he has once again hit a home run with this product! On this day we commemorate an exciting occasion, as well as a very sad one. First we say happy birthday to Muppet*Vision 3D which opened on May 16, 1991. This beloved attraction at Disney's Hollywood Studios turns 20 years old today. Unfortunately, exactly one year earlier, the creator of the Muppets empire passed away. 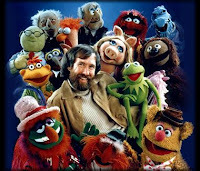 Of course I'm speaking of Jim Henson, who died of pneumonia on May 16, 1990 at the age of 53. Muppet*Vision 3D is a must see attraction when visiting Walt Disney World. It is a 3D movie that is shown in a replica of the theater where the Muppet Show took place. The show has been referred to as "4D" due to the audio animatronic figures and great special effects. There is even a live actor playing the part of "Sweetums" who is in the film and then actually walks into the theater. The movie is based on the muppet characters preparing for a variety show of sorts. It intentionally showcases tricks and gags that emphasize the use of 3D technology with objects jumping off the screen. It is always fun to watch guests reach out in an attempt to touch what appears to be right in front of their faces. In addition to the actual movie, the pre-show that takes place on video screens in the queue is hysterical. When this attraction debuted in 1991, 3D films were still a novelty. Nowadays, 3D technology is being used in a high percentage of full length movies, but Muppet*Vision 3D is still a unique and fun example of the genius of Jim Henson. Although the film is 20 years old, any production involving the Muppets is timeless and enjoyed by guest of all ages. Recently, Disney refurbished the attraction and digitally remastered the film giving it a fresh, revitalized look. In 1990, Jim Henson was in negotiations to sell his company to Disney. He felt that the two companies were a perfect match for each other and he was looking forward to focusing on the creative side of things. He died during the week that he was supposed to sign the contract. After his death, Henson's family decided not to sell to Disney. Fortunately, there was already an agreement in place to put Muppet*Vision 3D into Walt Disney World. In fact, this was the last project that Jim Henson worked on before his untimely passing. In 2004, Jim Henson's family finally sold the rights to the Muppets to the Walt Disney Company. A new motion picture simply entitled "The Muppets" is slated to be released by Disney on Thanksgiving weekend of 2011. This should be a great introduction to a new generation of Muppets' fans and Jim Henson's legacy will live on. In many ways, Jim Henson can be compared to Walt Disney. They were both dreamers and creative geniuses who focused on family friendly entertainment. They were both humanitarians who truly cared about people. Finally, although they have been gone for many years, they continue to touch the lives of countless numbers of people through their art. "When I was young, my ambition was to be one of the people who made a difference in this world. My hope is to leave the world a little better for my having been there." On New Years Day of this year, I kicked off this blog with an article about podcasting. I mentioned two specific podcasts that I considered my favorites in WDW Radio and Inside the Magic. Today I would like to add a third show to that short list. I am speaking of the WDW Today podcast. The WDW Today podcast is one that typically airs new episodes three times a week, on Mondays, Wednesdays and Fridays. They also do a live call-in show once a month. This podcast is a fun way to stay in touch with Walt Disney World on a regular basis. Each show is only about 20 minutes long and can be enjoyed on your drive to work. The show consists of a panel made up of a handful of Disney World experts. They chat about interesting topics related to trip planning and they often answer listener questions submitted by emails. They also come up with some offbeat ideas that are often humorous and always entertaining. WDW Today is comprised of four main panelists as well as recurring guests. They have quite a following and each of the panelists are well known in the Disney online community. The host of the podcast is Matt Hochberg. He is from my home state of CT and his passion for Disney had him relocate to Orlando a few years back. In addition to hosting WDW Today, he runs several Walt Disney World websites including StudiosCentral.com. Mike Newell does the production for the podcast and also runs an internet radio station called MouseWorld Radio. The third panelist is Mike Scopa who lives in New Hampshire and is a feature writer and blogger for AllEars.net. Last but not least is Len Testa. Len is the co-author of the Unofficial Guide to Walt Disney World as well as one of the masterminds behind touringplans.com. One of the amazing things about WDW Today is its longevity. This podcast was one of the first related to Walt Disney World and they have recorded over 875 shows! You can download current as well as past shows at iTunes.com. They are totally free and I look forward to each new show as they come out every couple of days. I certainly recommend listening to WDW Today as it will keep you connected to the vacation kingdom. You should also check out their website at WDWToday.com. Today we say happy birthday to the Norway Pavilion in Epcot's World Showcase. It opened on May 6, 1988 and was the last country to be added to the park. Norway is the second pavilion you come upon as you go clockwise around World Showcase Lagoon and it sits between Mexico and China. Although it is one of the smaller looking countries from the outside, it is the only one that offers dining, shopping, a ride and a movie. 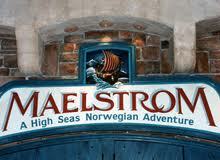 Norway's primary attraction is called the Maelstrom. It is an indoor boat ride that includes a small, flume style drop. It is about the size of the Pirates of the Caribbean drop over in the Magic Kingdom and provides the only "mini" thrill in the World Showcase. At the end of the 5 minute journey, guests disembark the Viking boats and enter a movie theater. You have the ability to continue right through the exit doors, but I suggest that you stay for the short movie. It is an interesting look at the "spirit" of the people of Norway. It is also a nice air conditioned spot to rest your legs before continuing your trek around the World Showcase. Like most Walt Disney World attractions, the Maelstrom empties into a gift shop. The Norway gift shop is called the Puffin's Roost and features trolls, sweaters, toys, and other Norwegian gifts. The restaurant in the Norway Pavilion is called the Akershus Royal Banquet Hall. 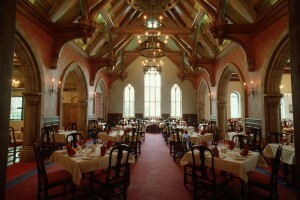 It is a medieval, castle-like fortress that serves authentic royal Norwegian cuisine. It is also one of the few restaurants in Epcot that features characters. In the case of Akershus, guests get to dine with Belle, Jasmine, Snow White, Sleeping Beauty, and Mary Poppins at a Princess Storybook meal. My family had the pleasure of attending one such meal a few years back and we had a great time. I have to admit that my three young nieces were a little more excited about the princesses than my little boy, but everyone enjoyed the experience as well as the food. One last area that I want to mention in the Norway Pavilion is the Kringla Bakeri Og Kafe. It is a little spot that serves snacks, sandwiches, and sweet pastries. One of these pastries that I tried on my last trip to Disney World is called a "lefse." It is a rolled wrap of potato bread with butter and cinnamon sugar. It is delicious and was certainly worth the $1.99 price. On your next trip to Epcot, make sure you stop by Norway and enjoy some Scandinavian cuisine and history. It has been a fun place to visit for 23 years and will certainly be enjoyed by Walt Disney World guests for years to come. Walt Disney World is one of the most accomodating destinations in the world for guests with disabilities. Whether it is the fact that most attractions are wheel chair accesible or that the Disney buses can accommodate guests in motorized carts, they know how to make all guests feel welcome and included whenever possible. This is especially true when speaking of a relatively new device that proves what is possible using modern technology. This amazing electronic marvel is called an Assistive Technology Device (or ATD). It weighs only about seven ounces and isn't too much bigger than a smartphone. 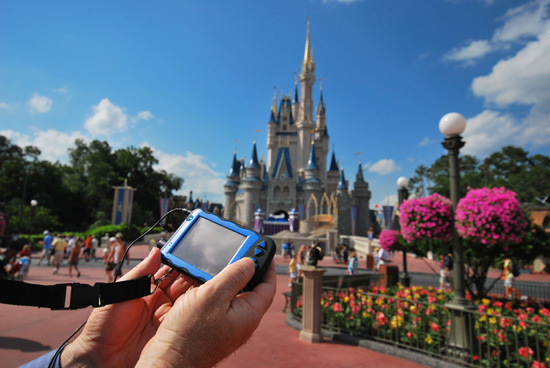 Its main function is to provide detailed audio descriptions of attractions and outdoor areas in the theme parks to visually impaired guests. The device can hang around your neck with the attached lanyard and includes a set of headphones. So how does this technology actually work? Using hidden sensors throughout the park, the device knows where you are located and will give occasional descriptions about what is around you. In addition to the general descriptions, the ATD has an easy to navigate menu system that allows guests to hear more information about the nearest attractions, restrooms, restaurants, and shops. While waiting in line for an attraction you will hear interesting information about the queue. You will then be guided by audio as to what is happening throughout the ride or show. From what I have learned, this device is truly a blessing to those with partial or total vision loss. But wait, there's more! The Assistive Technology Device is also a great help to the hearing impaired. There is a decent size screen that automatically provides the dialog for whatever ride or show you are visiting. I can think of many attractions where this would be a tremendous help to someone with hearing loss. Once again, kudos to Disney for finding ways to enhance the experience for all guests. 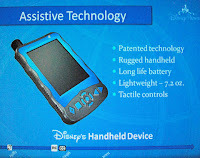 The Assistive Technology Device is available at the guest relations window at each theme park. It requires a refundable deposit but is otherwise completely free to use throughout your day. If anyone you know suffers from hearing or vision impairment and is planning a trip to Walt Disney World, please let them know about this great device. I'm sure they will thank you for it! On this date, May 1st 1989, Disney's Hollywood Studios opened. Actually, that isn't entirely true. The park that opened 22 years ago today was actually called Disney-MGM Studios for its first 19 years in existence. Disney re-branded the park as Disney's Hollywood Studios in 2008. The reason for the name change was summed up by the President of Walt Disney World, Meg Crofton. She said, "the new name reflects how the park has grown from representing the golden age of movies to a celebration of the new entertainment that today's Hollywood has to offer - in music, television, movies, and theater." There is an interesting story on how this theme park came into existence. A team of Imagineers were brainstorming to create two new pavilions for Epcot. One of these pavilions was the Great Movie Ride, which was going to be built between the Land pavilion and the Journey Into Imagination pavilion. When newly appointed CEO Michael Eisner saw the design of this attraction, he decided that instead of placing it in Epcot, it should be surrounded by a brand new theme park with a Hollywood theme. The idea for Disney-MGM Studios was born. When Disney-MGM Studios opened, it incorporated a real working television and movie studio into the theme park. A few of the movies filmed early on here were Ernest Saves Christmas and Newsies. In addition to live action movies, the animated films Mulan, Lilo and Stitch, and Brother Bear were created here. Several TV shows were also taped at the Disney-MGM Studios including the Disney Channel's Mickey Mouse Club. In more recent years, the production of movies and tv shows has subsided and Disney's Hollywood Studios has focused more on building bigger and better theme park attractions. Mr. Potato Head to keep us entertained. Today we say happy birthday to Disney's Hollywood Studios. It is the fourth most visited amusement park in the U.S. and draws close to 10 million guests per year. It continues to be a great theme park and should not be missed on any trip to Central Florida!